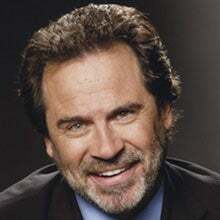 So is it mere coincidence that Dennis Miller starts his new sports show on Versus on the same day that we open our Sports Human of the Year nominations? (lowers glasses, looks thoughtfully at reader). We weren't born yesterday, babe. Sports Unfiltered with Dennis Miller kicked off on Tuesday, and if there were any of you who thought that the first guest wasn't going to be Curt Schilling, that's ten demerits, soldier. It was a wonderful segment, after which the two exchanged American flag lapel pins and waterboarded a Versus intern. Sports Unfiltered promises to pull no punches, and as proof, just take a look at one of their promos. You may notice that our hero promotes bull riding as "a real sport." Versus happens to feature bull riding. Yeah, Orwell, Huxley, Miller ... all cut from the same cloth. • WTF Statement of the Week. "The next big sport will involve tiny dwarfs strapped to the backs of rabid hyenas on a slowly moving river barge." • This Week's Word. Priapism. • This Week's French Word. Bouliabaisse. • Event of the Week. The All-Fetish Invitational at Hamburg, Germany. • Guests. Curt Schilling, Al Michaels, Brandon Lang. • Gratuitous 1930s Reference. "You look like FDR at Warm Springs." • Gratuitous 1970s Reference. "Willie Mays ended up with the Mets." • Statement That Was So Inexact That It Made Bill James Throw Up. "The Red Sox went something like 80 years without a championship, then they won two in the past several." • Other References. Robolock, God of the Harvest ... Lou Piniella, the loveable domanatrix ... Ike Turner ... snuff films ... fish who say f###. Segments included a rant, some interviews, a Weekend Update-style news spot, and the delightful "Ask Dennis", in which he answers viewer e-mail in — astonishingly — dismissive, mocking fashion. Overall, Miller's latest TV effort retains the air of all of the ones before it: Different at first, then confusing and tiresome, and ultimately canceled. If you disagree, why not head on over to the studio in Santa Barbara where they tape it, because they're looking for audience members. And possibly writers.